AICD is world renown...by those who value the best. Are you ready to be challenged as a fine artist? Do you want to develop precision carving skills? competitive edge in your ice sculpting abilities? "actual person" that people will recognize. You will even get to choose whose face you want to carve - such as an influentual leader, award recipient, celebrity, foreign dignitary, retiring associate, or special loved one! AICD student Executive Chef Billy Redd on left. Paul Germain on right. 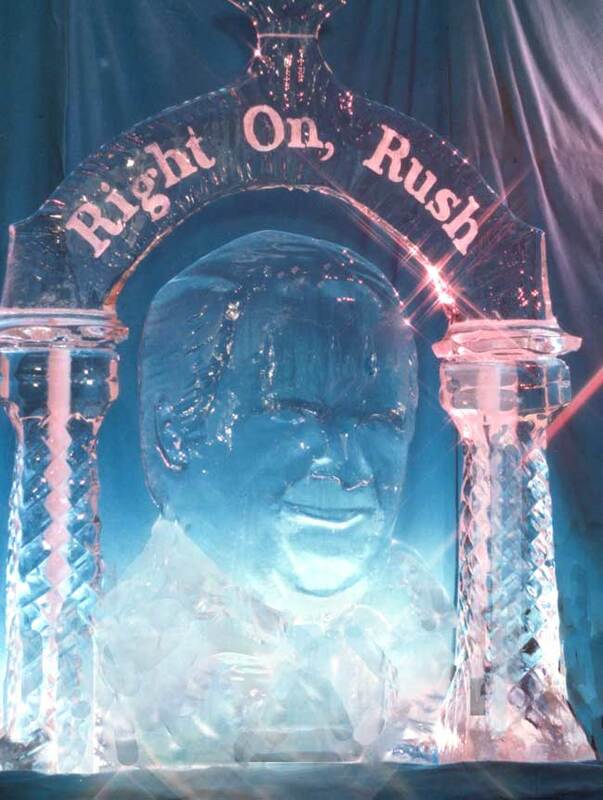 Does carving a real person's face (not just a generic face) in ice seem way too difficult or perhaps even impossible? 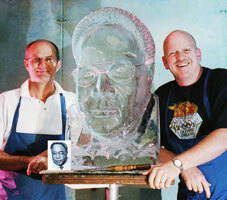 The process of carving realistic high relief portraits in ice is definately not easy. But, just like AICD's student, Executive Chef Billy Redd above, you will be amazed by what Paul Germain's legendary breakthrough teaching techniques and precision oriented portrait ice carving methods will enable you to do. 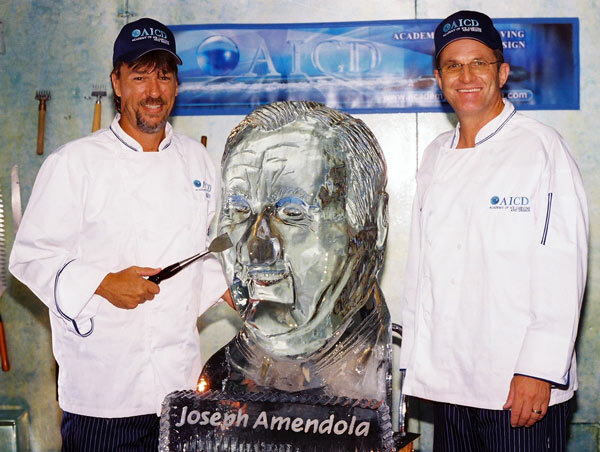 The above portrait was carved during instruction in memory of the Culinary Institute of America's beloved Master Chef, Joseph Amendola. 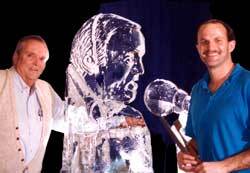 As with all of AICD's ice carving projects, the face carving in ice was sculpted solely by the student using AICD's acclaimed step-by-step method of face carving instruction under the direction of Master Instructor Paul Germain. Billy exuberantly said "I came to AICD as a craftsman, but left as an artist!" under the fascinating guidance of AICD's Master Instructor Paul Germain. your ultimate artistic goal a reality. Reserve your training dates now. Alex Haley, the noted author of "Roots", in a block of clear ice. This intensive program of one-to-one private instruction is available year-round. 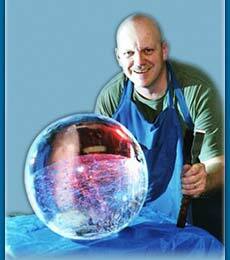 or commensurate experience (requires portfolio of previous ice carvings). The Portrait / Faces Ice Carving Program features 30 hours of private, advanced ice carving instruction with an emphasis in realistic high relief sculpting tecniques and visualization. 10 of the 30 hours consist of offsite coursework (in hotel) designed to make the student's preparation for the next day's instructional activities as beneficial and enjoyable as possible. Textbooks, drawing aids, clay, modeling tools, facial feature models, and other materials are furnished upon arrival at AICD for this offsite coursework. AICD provides one-to-one personalized instruction that is tailored for each student's experience and future objectives. Private instruction ensures that student carvers of any level receive far more actual training and individual guidance than is possible within group ice carving classes. It also provides a much safer and more productive learning environment for developing the advanced art skills needed for highly realistic and creative multi-block construction.